During the previous post, we indicated that the first element you needed for a celebrity style wedding – was the perfect destination wedding venue. The second item that you need is to have an exquisite designer wedding gown. For the wedding gown, she worked closely with Zuhair Murad — the designer behind some of her most famous red carpet moments. 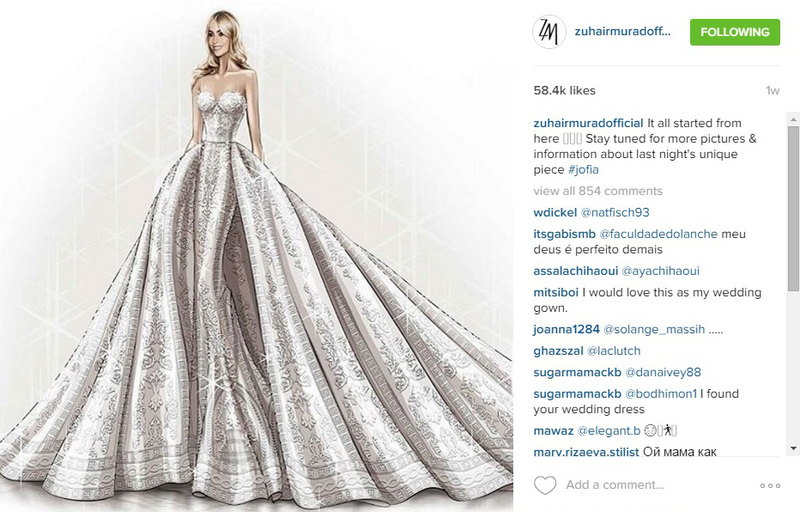 This first image is from Zuhair Murad’s Instagram post – a drawing of Sophia’s gown. This gown was a custom Zuhair Murad Couture design. It was a white strapless silk-tulle dress with a sweetheart neckline and hand-embroidered 3D embellishments on the bodice. A pearl beaded belt highlighted her waist, and a huge detachable skirt. (Yep, we think she “borrowed” this idea off of Wendy who made her wedding gown with a detachable train as well). 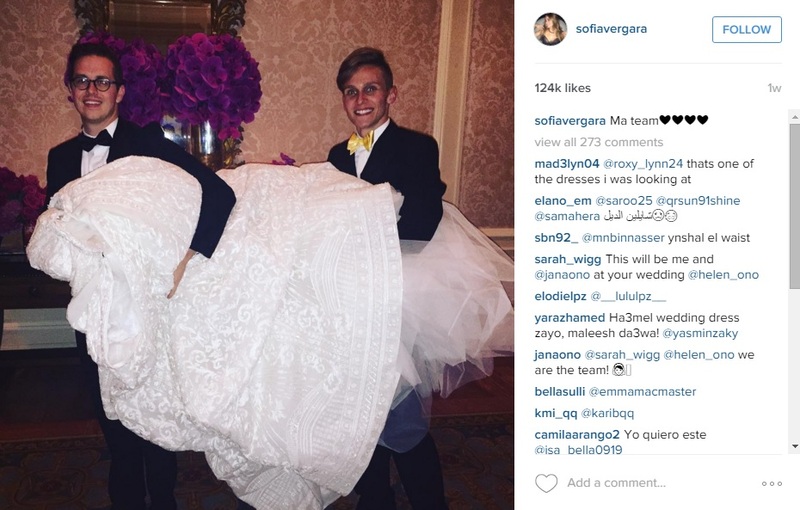 We love her friends helping Sofia out by carrying the train of her wedding gown. 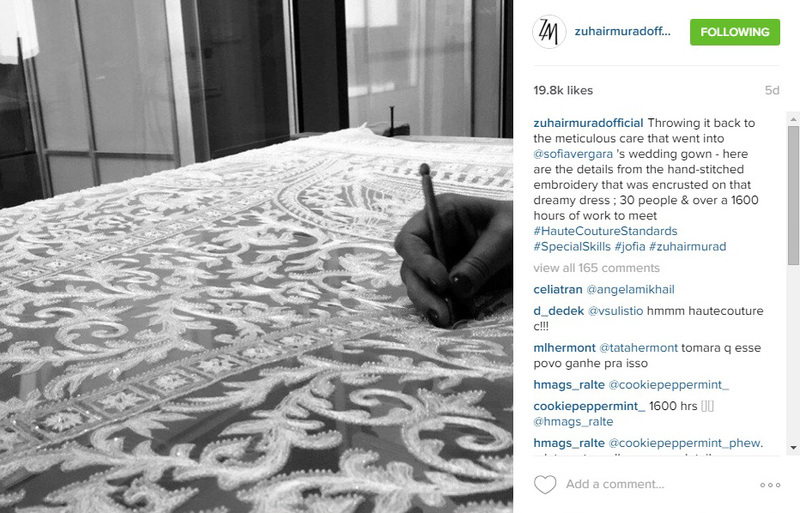 This next image shows someone doing the detailing on Sophia’s gown from Zuhair Murad’s Instagram feed. The final completed wedding gown with all of its magnificent details, again from Zuhair Murad’s Instagram post. Her wedding gown was covered in more than 11 pounds of sequins and 6 pounds of pearls thanks to all the intricate beading, and 32 people worked around the clock to complete the design, which took a total of 1,657 hours. Sofia did look absolutely fabulous and completely her look with Lorraine Schwartz diamond earrings that were apparently 55 carats, plus more diamonds by the same designer in her hair and on her wrist. We also wanted to comment on Sofia’s choice of dress for her cocktail party for her wedding rehearsal on Saturday. It was designed by Mark Zunino. The mini dress took three weeks to complete and used a whopping 62 yards of fabric; according to People’s magazine. The skirt alone has 14 layers of silk organza, and the lace bodice is hand-beaded and topped off with a neckline enhanced with crystal-encrusted lace leaves. We love how the skirt moves when Sofia dances. Here is Sofia enjoying the festivities from her Instagram feed. Please let us know what you think about her choices of gowns for her wedding. Do you have a favorite?